Extraordinary opportunity to own a brand new penthouse unit in one of the few luxury condominium complexes on sanibels east end. Located off east gulf dr. Is a private winding paver drive lined with palm trees that leads you to the quaint and private direct gulf front community of plantation village. Totally renovated top to bottom and inside out, this top floor, western exposure 3 bed + den and 2. 5 bath home leaves nothing to be desired from even the most discerning buyers. New plumbing, electrical, impact windows, flooring, bathrooms, kitchen, wet bar, appliances, recessed lighting, paint, and the addition of an office/den and half bath need to be seen for yourself to appreciate this thoughtfully designed and masterfully executed gem in paradise. Full and comprehensive list of all updates is available as there are too many to list. The buildings private roof top sun deck offers some of the very best views on sanibel island! Unobstructed gulf views to your west and fort myers beach, bonita beach, and marco island in the distance to the east. Fantastic place for both sunrise and sunset! C. 15586 - beautiful direct gulf views from this top floor corner unit. Look out to the gorgeous beach from your screened lanai and see the historic sanibel lighthouse in the distance. This 2 bedroom 2 bath unit is light and bright with high vaulted ceilings. The kitchen has white cabinets and appliances and quartz countertops with breakfast bar. The master has a king bed, great water views and sliders to the porch. Relax and enjoy the beach, pool, spa, sauna, tennis, shuffleboard or take one of the bikes and explore sanibel! 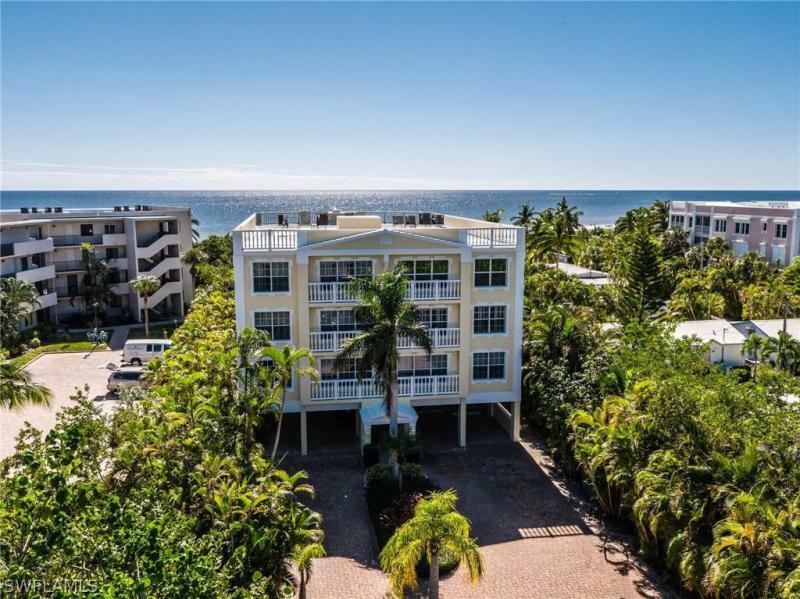 Shell island beach club is a low-density, meticulously maintained beach front condominium complex on the east end of sanibel near the famous lighthouse, fishing pier, miles of bike paths and restaurants. A fantastic vacation and investment property! Rental income: 2018 $62,145, 2017 $63,942, 2016 $61,221 with owner usage! 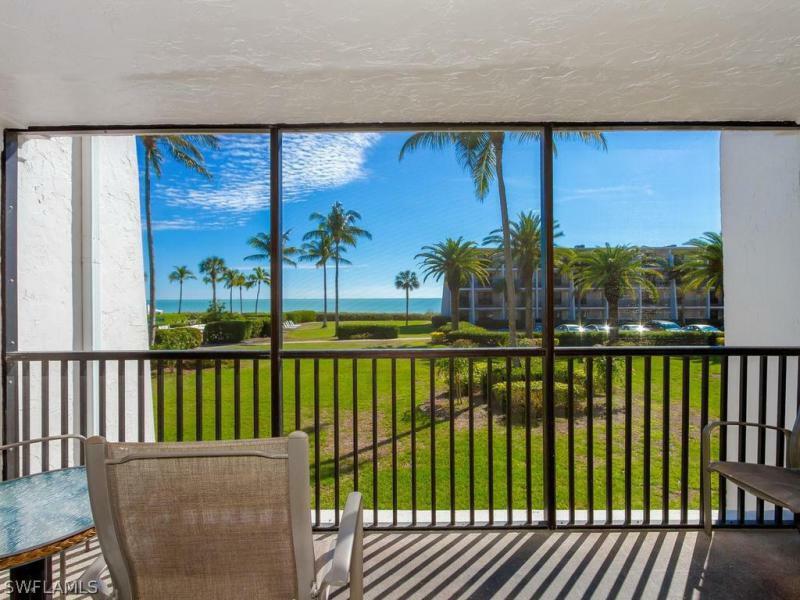 Located in one of the most sought-after locations in loggerhead cay, this remodeled unit has excellent gulf views and is only a short walk to the pool. The kitchen was opened up during the remodel removing the dividing wall leading into the dining area and converting it into a breakfast bar. Both bathrooms have also been remodeled in a timeless classic style that is compatible with anyone's taste in decor. Loggerhead cay is a popular beachfront condominium community on the east end of sanibel allowing for easy access on/off island and just a short bike ride to several local restaurants. Amenities include large pool, picnic area, tennis, shuffleboard, grills, clubhouse, on-site management, pet-friendly policies, and excellent income potential through weekly rentals. Enjoy remarkable gulf of mexico views from this updated, tastefully decorated, fully furnished, second floor unit in the sundial resort. With two bedrooms and two full baths, this spacious unit offers condominium convenience with all the comforts of home. Large tile floor in the kitchen and combo living/dining room and carpeted bedrooms. Both the living room and master bedroom open to the screened lanai where gulf breezes and beautiful sunrises await. Sundial j208 boasts a strong rental history and make this unit a must see! This condominium is part of a small, end-of-the-road gulf front condominium complex. It features 2 bedrooms, 2 bathrooms. It is a west-end corner unit with long sweeping views of the gulf of mexico from the screened lanai. The complex is sheltered on the west by a federally protected preserve. After a game of tennis or shuffleboard, take a stroll down the beach to collect some of the worlds best shells and to watch breathtaking sunsets. Return for a swim in the heated pool, or a cookout, with the on site bbq grills. Sandpiper beach has only 27 units and maintains the grounds and buildings in impeccable condition. You will be enthralled by the privacy, quiet and seclusion of this centrally located complex.